ดิ เอสเตท วิลลา ตั้งอยู่ใจกลางเดลลีตอนใต้ และเป็นจุดที่ยอดเยี่ยมในการออกสำรวจเที่ยวชมนิวเดลี และ NCR ใจกลางเมืองอยู่ห่างจากที่พักไปเพียง 25.0Km และเดินทางไปถึงสนามบินได้ภายใน 25 นาที จุดเด่นที่สุดข้อหนึ่งของที่พักคือ ท่านสามารถเดินทางได้อย่างง่ายดายจากที่พักไปยังแหล่งท่องเที่ยวและสถานที่สำคัญมากมายในเมือง เช่น วัดจหาตาร์ปุระ, วัดฉัตรปุระ, An Yahh!! It is very difficult to find the place for the first comers, but once you open the door there appears a pretty different world than outside local street. Although the facility is old but in a way it's like a neat mountain lodge. But it was a bid cold in the night when we stayed... Food is nice and the guys and the master(?) are very much friendly and assisting our needs. We love this place! The staff is wonderful. We also love the beautiful yard with grass and play equipment for the kids. The rooms are beautifully decorated and very clean. Quiet place with enough facilities and friendly staff. Lovely and quiet as it is a bit further out, the directions from the hotel were very useful for finding the place. We would stay here again. It is a quiet place. Good location in between Gurgaon, Delhi and airport. The staff was very helpful. I experienced some issue with internet connection at the second floor. Overall a good stay, a bit too expensive. The Estate is a great find. As someone who regularly travels the world for work and pleasure, it is a gift to find a place like this. 20-40 minutes by taxi from the airport (400 rupees in a prepaid: do not pay more! ), it is easily accessible from the center of Delhi from the nearby metro station. Be sure to give the driver the detailed instructions provided by the hotel, because it is hard to find and most Indian taxi wallahs will simply drive away from the airport and get lost. The staff of The Estate make you feel like visiting royalty in their home. They will go out of their way to meet your every desire and indeed fulfill any whim you might have. In the front and in front of the best room on the second floor, there are gardens groomed to look like a putting green, with swings and a jungle gym below for your children. Simple meals can be provided for a reasonable rate or you can enjoy the delicious street food in the market which lies just beyond a secret door at the back of the property. This is a typical Indian neighborhood with its food stalls, barbers, little shops and, best of all, NO TOURISTS (except maybe you). The rooms are furnished with antiques, impeccably clean, with reliable electricity, hot water, air conditioning and free internet. Stay at The Estate. You won't regret it! I only wish I had known about this B&B earlier. I might not have traveled so much around India and stayed put! I felt at home and cozy in this Lovely B&B with a wonderful staff, Home-cooked Meals and an Ambiance of Quality Living at reasonable prices. I HIGHLY Recommend! 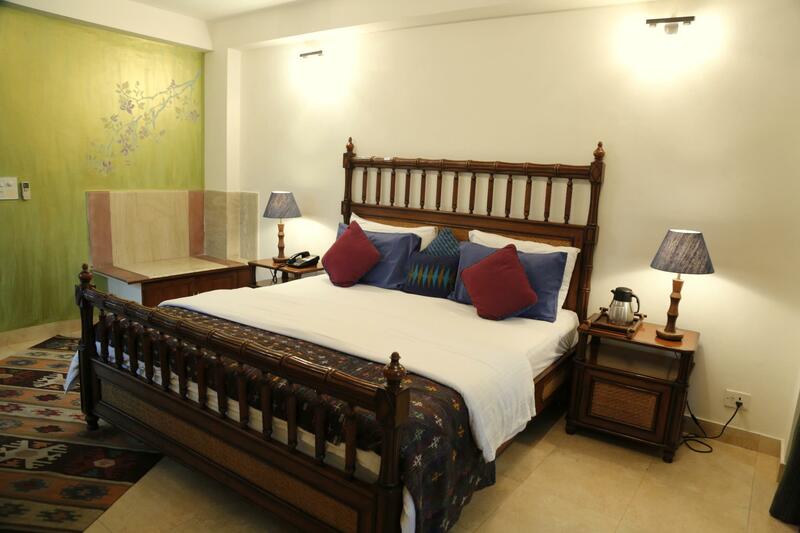 The Estate B & B was a perfect getaway from the hustle and bustle of central Delhi. I was looking for a place to relax for a few days, to unwind after a busy trip and i am glad i chose the Estate B & B. It is situated a little out of town in a beautiful estate. The property contains the main house and the guesthouse with a manicured garden in between where the Palm Squirrels play in the trees. Menu is limited due to its status as a bed and breakfast, however the optional home cooked meals were delicious (and very filling). When i walked into the Estate i immediately felt at home and relaxed and was very impressed by the beautiful antique furnishings. You can relax in the garden or take a short walk down the busy street to the local metro station. I stayed here for only one night and wished - upon seeing the room and the home - that it was two nights instead. The rooms are in an annex of a large compound in a private, walled compound in South Delhi and are well decorated and very comfortable. There were switches aplenty and clean sheets, towel, etc. It compared more than favorably with some palace hotels that I stayed at during the trip. This is really a jewel of place and makes the noise and hustle and bustle of Delhi so much more manageable with a place like this to return to everynight. Great Service and accomodation in a garden setting. the staff were very courtious and accomodating to our requests. we received an email on the previous day if we would like them to keep dinner ready for us as we were arriving late. one thing they could better is improve the cleaning and quality of the bathrooms and towels. Pleasant garden & very helpful manage & staff. We arrived in the dark & the hotel is very difficult to find. Once there relatively convenient for the airport & a couple of attractions.Dining area & sitting room pleasant but all in need of upgrade as quite shabby.Room good size & furnished ok but again needed upgrade. The fact that the bed & bedding was so damp was the main reason we didnot enjoy our stay.Staff, especially manager very helpful & as our flight was early hours, we kept the room at small extra charge. Beautifully decorated spacious rooms, spacious garden and outdoor area for children, elaborate breakfast. the bed was really comfortable, the rooms spacious and they gave my five year old daughter a free extra bed. the staff were lovely and helpful. the house was on the outskirts of new delhi but close to the airport. we enjoyed our stay here immensely. le personnel était à l'écoute et disponible, toujours disposé à nous aider pour le moindre problème, chambre propre et coffre fort, emplacement calme mais éloigné du centre donc utiliser un taxi est nécessaire. j'ai été malade et ils m'ont rapporté les médicaments nécessaire à ma guérison et le lendemain j'allais beaucoup mieux. je le recommande vivement pour la tranquillité et la sécurité du site en particulier pour les femmes. Wir würden auf jeden Fall wieder kommen. Im turbulenten Delhi eine ruhige Oase mit netten Leuten. Die Lage ist vielleicht nicht für jeden ideal, da etwas außerhalb des Zentrums. Wir sind immer mit der U-Bahn gefahren (8-10min zu Fuß), das muss man natürlich auch mögen - zur Stoßzeit ist sie, wie in Indien üblich, übervoll. Nachts ist die Straße, über die man den Hintereingang des Hotels betritt, ein wenig indisch-unheimlich. Alleinreisende Frauen sollten sie vielleicht meiden, zu zweit würden wir auch nicht nach 22 Uhr zu Fuß herumgehen. Das Hotel ist sauber, die Zimmer sind absolut luxioriös, das Essen gut (auch wenn wir meist außerhalb gegessen haben). Ett fantastiskt trevligt B&B. Vi möttes av ägarinnan och en kopp te och togs emot av en personal som gjorde allt för att vi skulle känna oss som kungligheter. Det är 7-8 minuters promenad till metron. Taxi ordnas på ett enkelt sätt liksom hjälp med att besöka turistattraktioner eller som vi gjorde spela golf. Bilderna på hemsidan motsvarar helt hur det ser ut i verkligheten. Kvällar och nätter var kalla i Delhi under vår vistelse men genom värmefläkten hade vi det skönt inomhus. Poche camere Hotel davvero tranquilloanche se periferico. atmosfera piacevole come ottima la cucina. La signora, credo Matma, è stata inpagabile in gentilezza e disponibilità nell'aiutarci a completare e risolvere alcuni problemi sulle prenotazoni. สถานีรถไฟใต้ดิน Sultanpur - ระยะ 0.69 กม. ตลาดดิลลิ ฮาต - ห่างจากที่พัก 9.88 กม.